Several Ukrainian friends have asked me recently why I am wearing a small, red flower – a poppy – on my jacket lapel. It’s because the United Kingdom together with other Commonwealth nations will commemorate Remembrance Day on November 11th. The poppy is the symbol of this day. So the first reason I wear a poppy is to remember with gratitude the sacrifice of those who have died in war so that we may live in peace. People like Lieutenant Edwards who died in Khmelnytskyi in August 1917 and Private Rabey who died in Odesa in 1945. Their graves remain in good condition in these cities today. 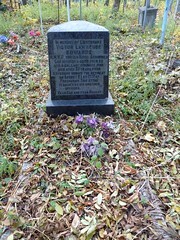 I also remember the many members of the British Armed Forces who have died in what is today Ukraine during and just after the First World War but today have no known grave, such as Able Seaman Nicklen who died at Yalta in 1919. Their individual graves and memorials are today marked and maintained by the Commonwealth War Graves Commission. This remarkable organization looks after the last resting place of over 900,000 servicemen and women who lie in marked graves and over 700,000 monumental inscriptions to the missing. As Albert Schweitzer noted “the soldiers’ graves are the greatest preachers of peace”. I also wear a poppy to support the Poppy Appeal which raises funds for the Royal British Legion. This charity provides support to the millions who have served and are serving in our Armed Forces, and also to their families. The emphasis of this year’s Appeal is help for those who are serving or have served in Afghanistan. More details about how you can support this worthwhile cause in Kyiv can be found here. So this November I again wear my poppy with pride and gratitude. A link to photographs of last year's Remembrance Day ceremony in Kyiv is here.